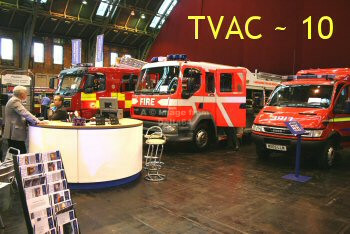 I feel sure that all visitors to the site will join me in sending good wishes to all at TVAC as the company this year celebrates its 10th anniversary of building fire engines. As ever, I remain very grateful to the management and staff for their continued help and support in allowing me to bring regular updates to this site. Included for the first time are appliances for Derbyshire Fire and Rescue Service. Also in build is the first batch of production DAF LFs for Lancashire which should be gracing the streets of the county in the not too distant future. Work is also in hand for the various North East brigades. The early Lancashire LFs are nearing completion and are now identifiable by their registration plates. The appliances for Northumberland, Durham and Cleveland are progressing well, to round off this particular visit. As ever, there is a very interesting collection of pictures for a variety of brigades. Not previously included are Cornwall, Guernsey, Mid & West Wales plus the Fire Service College. Other appliances are shown for Cheshire, Lancashire, Leicestershire and Merseyside. The Welsh appliances contnue in build with a South Wales and two Mid & West Wales examples illustrated. One of the new Ategos for London is shown undergoing special glazing. Remedial work was being carried out for both Merseyside and Lancashire, whilst 3 of the final batch of LFs are illustarted, plus 1 of the current batch. Finally, in this update another brigade not previouisly seen is Somerset, who have a Water Carrier in build. I am indebted to the TVAC management for allowing me to produce this special update following the arrival of the first CARP which will eventually be heading east to Humberside.